Titanic parked by the River Seine in Paris. It is as long as three Mercedes Benz Smarts! Deep inside we all harbor a fantasy. For some it's on a golf course or race track; for others it's bagging an elk or a sailfish; or a winning streak at Vegas or Wall Street. It may even require a Jacuzzi, 5,000 gallons of Mazola and a Brownie troupe. For years I dreamed of shipping one of my old cars to Europe for weeks of bumping around England and the continent, visiting car museums during the week and car events on weekends. It took three years to bring to fruition. It was worth the wait. My automotive passions are twofold. Both focus on styling. Foremost are cars from the Paris coach building salons of the late 1930's (Joseph Figoni and Ovidio Falaschi, Jacques Saoutchik, Franay, etc.) Hence my craving to visit car museums. Owning a Bugatti is not in my budget, so my other passion is American customs. I've always been a different drummer, a 24-volt guy in a 12-volt world. Many car devotees are way too serious. Some abhor taking their toys out in the rain. I feel collector cars should be fun, often designed with tongue in cheek. It was a prerequisite that the car involved in this junket had to be outrageous and, if possible, ridiculous. The tackier and wackier the better. In high school in 1957 I'd sketch my ultimate dream leadsled, a '56 Lincoln with extended fenders and hooded headlights. Forty years later I purchased a mild custom 1956 Lincoln Premier two-door hardtop in Alabama. Then I added a continental kit and other modifications. We lopped the rear quarters off a boneyard Lincoln and grafted them on, extending the fenders 18 inches. I also love lowriders. Any car, truck, or bus looks better when lowered. Chop it 'n drop it. The lower the better. Not a hopper, thank you, a pancake. I chose airbags over hydraulics because they provide superior ride. They're the current rodding rage. The setup is from Air Ride Technologies of Jasper, Ind., the industry leader in hot rod airbag R&D. We can drop the car to the ground when parked for "the right look," but touch a switch to bring it to normal ride height in a minute. Seventeen years ago I started a fictitious club (no meetings, no dues; just a state of mind) called The Manhattan Lowriders. The only thing that makes less sense than a lowrider in Manhattan is taking one to Europe. Our motto is "Too much is better than not enough!" The car is "longer, lower, wider" stretched to wretched excess.automobiles as art.practicality be damned. The Titanic is Goin' DOWN! Four months before shipping the car to England it entered a crash program at Ram's Rod Shop in Dover, Del. Ramsey Mosher cut off the top and had Charlie Scribner at Classic Glass in Torrington, Conn. chop the windshield four inches. Ram fabricated a lift-off landau-style half top with removable front roof portion over the driver. His crew stretched a set of fiberglass bubble skirts to 9 1/2 feet in length and restyled the front end. Don "the Egyptian" Boeke of Dayton, Ohio mixed a custom blend of House of Color "Liberace Lavendar" pearlescent paint, and Ram applied it. Bobby Sapp of Milford, Del. stitched the interior and half top. A 20-foot long car is no longer a car, it's a pocket battleship. Hence the license plate "TITAN1C." Artist Joel Naprstek had a bit of fun with the connie kit. The life boats in the following photo are Nash Metropolitans. We cracked a bottle of champagne over the front bumper and whisked the car into the 40-foot container to make the shipping deadline with not a day to spare. We didn't have time to rub out the paint job. My loving wife of 32 years, Virginia, does not fly so, needing a co-pilot, I called my trusty bail bondsman and interior decorator, "Reverend" Michael Witek of Buffalo, NY (Church of the Perpetual Indulgence). My travel agents, Peter Seiler and Chris Fowler decided to tag along. Pete doubled as our sommelier. Tunes were a necessity. DJ "The Golden Gup" assembled a special CD for our tour-20 songs with lyrics about America or the USA such as "America" from West Side Story, "American Woman," James Brown's "Living in America," etc.) We were ready! We broke the trip into three chunks: two weeks in England in mid-September, three weeks in England, France, Belgium and Germany in November, plus a week in Stuttgart in January. Between junkets we left the car in the UK and Germany, flying home to recuperate. Who says the roads in Europe are narrow? 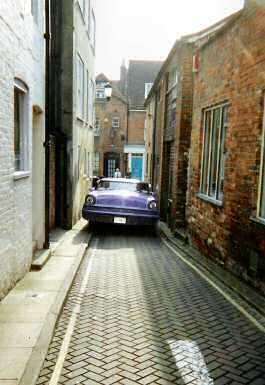 My bail bondsman and interior decorator Reverend Mike negotiates a typical English thoroughfare in Winchester. In England we visited the Midlands Motor Museum (Bridgenorth, Shropshire); our favorite car museum in England, the National Motor Museum (Beaulieu); the Museum of British Road Transport (Coventry); and the museum in Covent Garden. We attended Beaulieu Autojumble, England's largest vintage auto parts swap meet. We hit the International Drag Racing Championships at Santa Pod, where the car was mobbed. We had an unqualified blast in the UK. England is magic. The people are friendly, the tubes (subways) are safe and spotless, and the towns are clean and charming. The rolling green hills of the country, spotted with an occasional castle, are nothing short of spectacular. Everything, however, is more expensive than stateside (alcohol at $11 per cocktail!) and British sausages seem filled with sawdust. Unquestionably the high point was the Goodwood Circuit Revival. Lord March (real English royalty!) is the visionary who conceived the ultimate vintage race car meeting, giving attention to the smallest details. Only pre-1966 vehicles are allowed in the pit and paddock. No cell phones or beepers, please. Competitors must dress appropriate to the theme of the weekend (1948-57). Ladies are asked to dress "sympathetically." 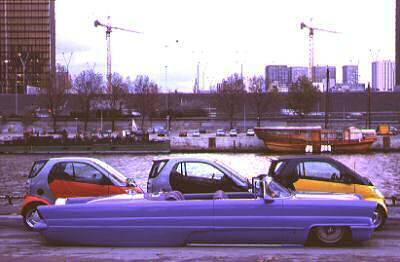 They even carpeted the entire party in lavender rugs to match our lowrider! Lord March knows how to do it RIGHT. Lord March surprised 1,000 guests by debuting our lavender lowrider, bathed in purple-gelled lights, on a slowly rotating turntable. It was the centerpiece for his black tie dinner. Upon arrival, we told the stage crew that we had a theatrical smoke machine built into the car. They had four smoke machines built into the platform, so they outbid us. The stage and even the rugs were purple. 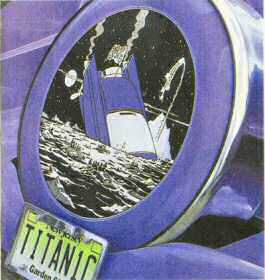 Titanic flat killed 'em. After dinner we fired up the engine, cackled the glasspacks and the 18-ft long tailpipes to the delight of the audience, and drove it off stage with our stereo cranking at the max. The bluebloods loved it. Hanging out with a bottle of champagne chilling on the roof of the Titanic, cranking Little Isidore & the Inquisitors through the exterior speakers, surrounded by vintage cars and people in vintage togs, it was crystal clear that life just doesn't get any better than this.